Actros ... among the most versatile of Mercedes-Benz’s construction vehicles available in the Middle East. These include the full range of Mercedes-Benz trucks including the Actros, Atego and Accelo models that are being rolled out of its Jeddah assembly line, which this year marks four decades since it produced its first Mercedes trucks. This mega supply deal was signed in March by Jipco with Al Khaldi Transport, with whom it has been enjoying a business relationship since the 1970s. 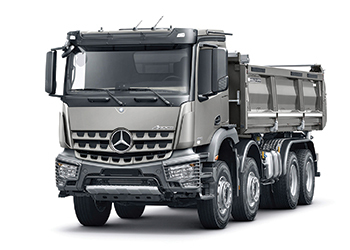 Jipco is the sole agent and distributor of Daimler commercial vehicles in Saudi Arabia. The industrial products division of Jeddah-based EA Juffali & Brothers, Jipco was established in 2002 to provide sales, marketing and after-sales support for the Mercedes-Benz range of commercial vehicles. Despite the challenging regional market, the scale of this commercial vehicles order underlines the strength of the Mercedes-Benz brand and its powerful automotive value proposition in the region. Saudi Arabia is a core market for Mercedes-Benz trucks in the Middle East and North Africa (Mena) area with more than 43,500 trucks delivered since Jipco was established. It is estimated that Saudi Arabia constitutes between 60 to 70 per cent of the total Mercedes-Benz commercial vehicle market for the region. The Al Khaldi order was the result of the company’s customer-centric approach, according to Kobus Van Zyl, general manager of Jipco and National Automotive Industry Company (NAI) – a joint venture between Juffali and Mercedes-Benz Commercial Vehicles. “This was and will be an incredible team effort for the total term of the contract and beyond, with all trucks being delivered by Jipco in the second and third quarters of 2017,” he added. “Our factory will increase local production in order to fulfil this demand. This will be good news for job retention. We are also engaging with other stakeholders in the industry to increase localisation, understanding the challenge of volume and global competitiveness,” Van Zyl said. EA Juffali & Brothers established its first assembly plant in Jeddah in 1974 with the formation of NAI. It began by producing commercial vehicles from semi-knocked down (SKD) Mercedes-Benz components, progressively developing the plant’s capabilities, production scale and manufacturing facilities to enable full assembly by 2013 for Mercedes-Benz on a local basis. NAI became the first automotive factory of its kind in the Middle East when the first Mercedes trucks rolled off the Jeddah assembly line in 1977. The plant now has four decades of assembly and production experience in Saudi Arabia and stands as one of Mercedes-Benz’s leading global plants having received ISO 9001:2000 certification in 1994, said Emad Dafterdar, Jipco’s director of marketing and sales for Mercedes-Benz commercial vehicles. Jipco and Al Khaldi Transport officials at the signing ceremony. Van Zyl also indicated that Juffali intends to relocate its production facilities to a new, state of-the-art facility by 2019. Jipco has several German-speaking Saudi engineers who are sent to Stuttgart for technical training and other global facilities. In this way and in association with Daimler, Jipco provides customers with unparalleled quality Mercedes-Benz products, services and support across the kingdom. “For many companies in Saudi Arabia, the purchase of a Mercedes-Benz truck is identified very much as a Juffali truck. A Juffali truck is almost a generic term for Mercedes-Benz such is the strength of our long associations, backed by dynamic sales, proven service and maintenance support and technical partnerships,” said Dafterdar, who is rightly proud of the Juffali and Mercedes-Benz heritage and is passionate about all things automotive. Juffali first entered into the automotive sector in the 1950s through its association with Mercedes-Benz, a partnership that has flourished and developed from supply and services into authentic in-kingdom manufacturing. “Juffali is still very much a family-orientated business and our relationship with our customers is paramount. The Juffali brands are exceptional and we are proud to serve our customers with our range of products. “The market in 2016 was very challenging and competitive but Juffali and our brands have a great value proposition based upon the strengths of our technical capabilities and top-tier service levels,” Dafterdar continued. Dafterdar emphasised the vital importance of the Jipco sales and after-sales network across Saudi Arabia. It has four primary sales areas centered on Jeddah, Riyadh, Dammam and Abha with service and spare parts capabilities in Jeddah, Makkah, Madinah, Riyadh, Qassim, Owaidah, Sulay, Dammam, as well as Abha, Khamis Mushayt and Jizan. In the Eastern Province, Dammam, Al Hasa, Jubail and Hofuf all have sales, service and spare part capabilities. Jipco is also the authorised dealer for Freightliner and Western Star ranges of trucks provided by Daimler. Over the years, Juffali has established key partnerships with many of the world’s leading companies that have endured and expanded in alignment with the requirements of Saudi Arabia’s industrial development. EA Juffali & Brothers, which was established in 1946, is today a multi-faceted industrial, manufacturing and services conglomerate. Its business sectors includes automotive, technology, air-conditioning and refrigeration, construction, chemicals and services. Within the Juffali Group, Arabian Metals Industries Company (AMI) was established in 1976 to meet the increasing demand for a broad range of customised commercial vehicle super-structures. AMI has a modern purpose-built facility in Jeddah manufacturing any product requiring sheet metal fabrication, welding and machining. These capabilities include the production and assembly of truck bodies, tippers, cargo boxes, tanks, trailers, semi-trailer tankers refrigeration boxes and garbage trucks.